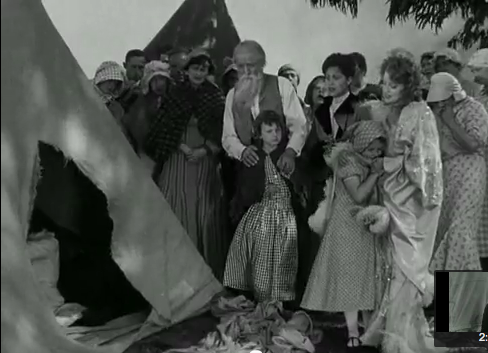 Jeanette MacDonald singing “Nearer My God to Thee” with survivors of the 1906 earthquake in “San Francisco” (1936). As a native of the San Francisco Bay Area, this film has always held a special place in my heart. The story is of a young singer, Mary Blake (MacDonald), who emigrates to California just prior to the San Francisco earthquake of 1906, and is torn between two venues–the lower-class Barbary Coast, run by “Blackie” Norton (Clark Gable) and the Tivoli Opera House, for which her classically trained voice is better suited. She is also torn romantically between the operators of the two venues, and the beginning of the movie is dedicated to her exploration of this conflict within herself. The story is nothing special, it has been done in different ways many times before and the only thing that really makes it stand out is Jeanette MacDonald’s famous soprano voice, singing operatic arias at Tivoli, and the jazzy tune “San Francisco” at Blackie Norton’s.”San Francisco,” by the way, has become one of the official anthems of the city, and has been covered by countless artists over the years since this film’s release. Here is a video of Jeanette singing the song in the movie. I sincerely apologize for the quality of this particular video, specifically the advertisement at the beginning and the coloration of the film. This is the only video on the internet of this number as it exists in the film, and I am unable to upload a more quality one on my outdated computer. So this will have to do. What I would like to focus on is not the story, not the songs (though admittedly Jeanette MacDonald is a highly accomplished classical singer, and it is a joy to watch her), but rather the final 15 minutes of the movie. As Mary Blake performs at Blackie’s, the earth begins to shake, first a little, then violently as glasses break, chandeliers fall, and the entirety of the audience flees for their lives and people pour into the streets. What follows is the most lavishly constructed disaster scene in a film up to that point, and if I do say so myself, one of the most technically advanced disaster scenes of any decade (adjusting for technology available at the time of filming, of course). With the use of quick cuts at the height of the earthquake sequence, followed by long, wide shots at the end, director W.S. Van Dyke succeeds in evoking a crippling sense of panic and fear followed by an almost serene surveying of the damage and loss of life, key real life emotions in the wake of any disaster. In this video, pay close attention to the shaking ground. That was not trick camerawork, as would have been employed in earlier films–the production designer, Slavko Vorkapich, created a set that rocked and shook, simulating the strength and damage the earthquake wrought 30 years prior in real time. The crumbling San Francisco buildings were dollhouse miniatures shot from below in order to make them look like tall structures capable of the damage Van Dyke sought to replicate. The earthquake starts at 1:03. It is clear just how much future disaster films took from this scene. From Earthquake (1972), which employed the same rocking set that Vorkapich created for San Francisco, straight down to the epic Titanic (1997), which contains a scene in which a mast falls crashing onto a civilian almost identical to what occurs at 2:30 in the video above. The final scene of the film is one in that, no matter how many times I watch this movie, never fails to give me goosebumps. High above the city in the evacuation tents, Mary Blake sings the spiritual “Nearer My God to Thee” a capella with the survivors of the earthquake. It is a somber melody that echoes the melancholy felt at the loss of all that was precious to them. Soon, a messenger announces that the fire following the earthquake has been extinguished. Amidst cheers and choruses of “We’ll build a new San Francisco!” all their cares melt away as they march proudly back to the city, singing a joyful rendition of “Battle Hymn of the Republic.” The film ends on a note of hope and optimism for what the future holds for this city and all those who reside there. The theme of eternal hope in the wake of a disaster is sure to pack a punch for anyone, but as a native of the San Francisco Bay, this scene is especially powerful emotionally. To know that this tells the story of your own history and your own identity, evokes a very special and indescribable sense of belonging and ownership of the tale. Each time I watch this film, my love and pride for San Francisco is renewed, and that is a unique connection that can’t be quantified. 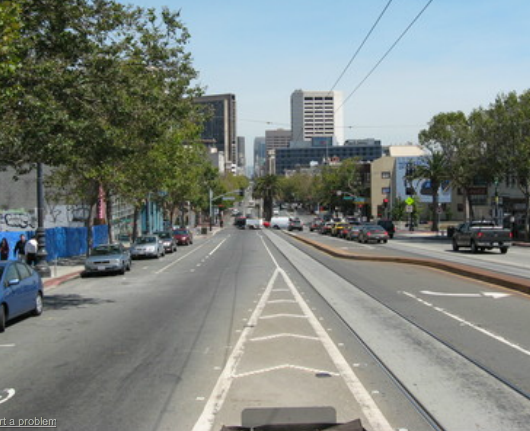 Here is a link to the last scene of the film, and I have followed it with pictures of San Francisco as it looked after the earthquake, juxtaposed with images of San Francisco today. Click here to watch the ending of San Francisco on the official TCM website. 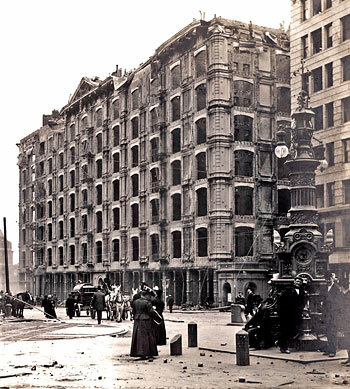 Upper Market Street during the fire that raged after the earthquake in 1906. Lotta’s Fountain, the official meeting place for families searching for loved ones during the 1906 earthquake. Lotta’s Fountain today. Every year at 5:12 am (the time of the initial shock) on the anniversary of the earthquake, a ceremony is held here in remembrance of the victims and in honor of the survivors. The Ferry Building was miraculously untouched during the earthquake. Here is a sharp contrast between the untouched Ferry Building in the background and a completely destroyed building in the foreground. 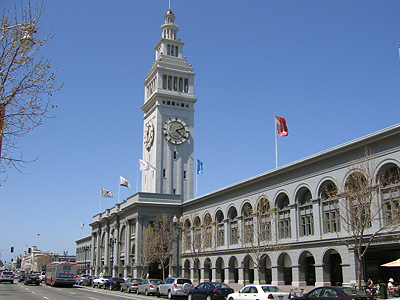 The Ferry Building as it looks today, a real monument to San Francisco. Today it not only serves as the port for ferries to and from Marin County, but boasts a popular array of shops and restaurants inside. This entry was posted in Lara Gabrielle Fowler and tagged 1936, earthquake, jeanette macdonald, San Francisco. Bookmark the permalink. Great work with the comparison photos.